Stems: Square in cross section, ascending to erect, simple or branched distally, sparsely pubescent to pilose, sometimes glabrescent below. Leaves: Cauline, opposite, simple; stipules absent; petiole .2 to 2.8 inches; blade broadly ovate to broadly elliptic, 1 to 6 inches long, .6 to 2.8 inches wide, base tapered to wedge-shaped, margins usually coarsely toothed, occasionally lacerate, tip acuminate, surfaces glabrous or sparsely puberulent, especially along veins. Inflorescences: Spike-like racemes, .8 to 6 inches, terminal and axillary; bracts elliptic to ovate, apex acute to acuminate, glabrous. Flowers: Calyx campanulate, 1/12 to 1/8 inch, tube 10-nerved, lobes 5, narrowly to broadly triangular, apex acuminate; corolla white to lavender or purple, 1/10 to 1/6 inch, weakly 2-lipped, lower lip 3-lobed, medial lobe slightly larger than lateral lobes, upper lip 2-lobed, flat; stamens 4, slightly exserted, filaments straight; style 1, basal; stigmas 2. Fruits: Schizocarps comprising 2 to 4 mericarps; mericarps brown, globose, less than 1/12 inch, glabrous, finely reticulate. Uses: The seeds are a source of oil that was used in the manufacture of lacquer, artificial leather, paper umbrellas, printer's ink, and waterproof clothes. Comments: Perilla native East India name and frutescens shrubby. 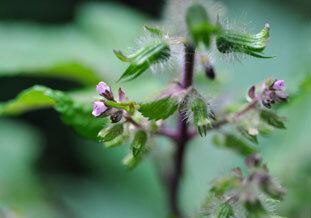 Some cultivars of Perilla frutescens are grown for their bronze or purple foliage. Considered an invasive weed in some states.